My experiences buying and selling online, locally, used, and new. I often get asked where I buy my guitars. I’ve purchased 11 guitars to date. I have purchased them from small local stores, large retail stores, online, and from private parties. I’m going to give you the pros and cons of each so you can buy your guitar gear with confidence. I love small businesses like my friendly local music store. They usually provide great service and they know their merchandise very well. 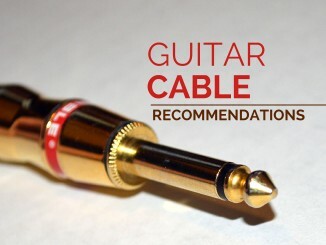 You should buy from a small retail music store when you want to browse and test some guitar gear. They may allow you to trade your existing music gear to save money on your purchase. They may also discount your purchase if you’re buying several items. They can direct you to local guitar teachers, and connect you with the local music community. If you’re in the market for a used guitar, they may have a few in stock. I purchased my first three guitars from a small local music store. They discounted my first guitar because I also bought a practice amplifier, cord, strap, strings, and picks. I also purchased my Epiphone Dot for a very low price because it had a small cosmetic defect. It saved me around $100. You won’t find those online very often. If you are worried about payments, small retailers may offer a payment plan or a layaway program. You shouldn’t buy from a small music store if you want the largest selection. Small music stores usually stock a few selected brands rather than all of them. If you want a great selection that you can get your hands on, visit a large music store. They stock all the major brands. Often, you can buy from them online in addition to locally. When I purchased my Martin acoustic, I went to my Guitar Center because I knew they had a large selection of acoustics. I played every single one in their “high-end” section. In the end, I chose a Martin D16-RGTE with a cutaway and electronics. Usually cutaways lower the volume, but this one projected better than more expensive guitars without cutaways. I bought it on the spot and I couldn’t be happier with it. I also got 0% financing to make it easier on the budget. In addition to the benefits of a wide selection and financing, large stores often have price matching and layaway programs. They will probably try to sell you a protection plan too, but I don’t recommend them. If you want personalized service, ask for a manager. When I bought my Martin acoustic guitar, the manager threw in a guitar humidifier for free after the sale had completed. They may be able to discount your purchase if you buy several items. If you need repairs, they provide them. Often, they can recommend a guitar teacher too. Large music stores are often a great choice, but they may not serve your location well. Mine is 1.5 hours away. I go there when I drive past it, but it is not convenient. You won’t get the same personalized service as a small music store. In my experience, some salespeople know their merchandise and others do not. Ask for a manager to find out who can answer your questions. Buying online is my favorite way to shop. You’ll have the best selection, and you’ll find some of the best prices. They also have good return policies so you can test it and return it if you don’t like the guitar. There is no doubt that you’ll find the best selection of guitars online. They even sell used guitars online. Usually, they are the cheapest option. They will even match competitor prices. When buying online, you will notice that there are a lot of features and filters. You will see the exact specifications for your guitar. Local stores do not always give you the exact specs, so it is harder to find the exact set of features that you want. Guitars purchased online usually ship for free. They can also be returned for free in most instances. There may be a handling fee in some circumstances. Check with your online retailer for details. The negative to online shopping is that you lose the ability to try before you buy. You can, however, buy, try, and return. I did this once with a guitar. I was able to get a full refund. I printed a return label, packaged it in the original box and had the option to drop it off at UPS or leave it on my doorstep for pickup. Returns are often free, but there may be handling fee. Please, check with your retailer first. If you want to trade music gear to the store, you will have to go to a real store. The managers need to check the condition. There are several online retailers. I use Amazon for many of my purchases, but I recommend Guitar Center for guitar gear purchases. 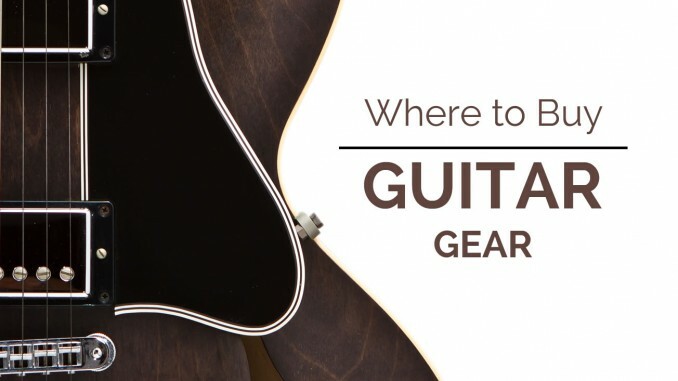 There are simply too many options to sift through and they have the best webpage for finding the guitar that you want. They also have the largest used guitar selection I have ever seen. As I’m writing this, they have approximately 13,000 guitars for sale (new and used), and you can easily filter through the options. Shipping is free, and they can ship directly to you or to your local Guitar Center. They have a 45-day return policy, but I would verify that it hasn’t changed for your item. You can even buy online, but return in the store. There is a huge market for used guitars. You can find them on craigslist, eBay, message boards, classifieds, etc. I also group pawn shops in this category. You can save a lot of money now, but it may not save you money in the long run. Because the selection of used guitar advertisements is generally smaller, you might settle for the wrong guitar because you got a great price. The wrong guitar will just make you buy twice. With all that said, I’ve purchased three used guitars. I met the sellers in person and paid cash. To be safe, I brought a friend to make sure it wasn’t some creepy scam. All three transactions worked out fine, but two of the guitars had a problem that I didn’t spot until I brought it home. My first, was a 1986 Japanese manufactured Fender Stratocaster. It played fine, but the frets were a little worn, it needed new springs for the tremolo, and the guitar had a large chip in the bottom corner that I didn’t notice. It wasn’t a huge deal, but I couldn’t return it. The second was my Fender Lone Star Stratocaster. I bought it off a guitarist in a local band. The transaction went fine, but the guitar had been used a lot. It had a loose connection that I didn’t realize until after I purchased it. It was easy for me to fix with a soldering iron, but it illustrates the problem with buying online. The third was a Squier Stratocaster, which I bought off a local student. I think I paid $50, which was a steal. This guitar was in perfect condition. It had no problems. I later sold it because I liked the upgraded pickups in my Lone Star Stratocaster. When you buy from a private party, you will take more time to find the right guitar, you won’t have a return policy, and you may pay more to fix or replace it. I want you to buy with confidence, so I urge you to be cautious and safe when buying from a private party. Sometimes you can buy directly from the manufacturer. Usually, this option costs more, but it may be worth it if you want a guitar with specific features. Usually, direct sales are not discounted, which is why I don’t usually recommend buying direct. It is, however, worth checking before you finalize your purchase. In 2000, I toured the Martin guitar factory in Nazareth, PA. It was a great experience. You could play a lot of their guitars in the waiting room. You could ask questions about every step of the process. You could even buy your guitar there. They also had a used guitar shop at their old factory. My friend bought a guitar there for a nice discount.